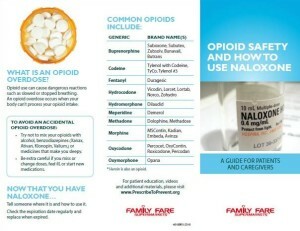 GRAND RAPIDS, Mich. – Select Family Fare and D&W pharmacies in the greater Grand Rapids area are piloting an Opioid Safety Project program – the first of its kind in the state being offered by a major grocery retailer. 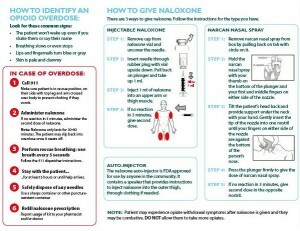 The project aims to reduce prescription drug overdoses by providing patients who visit the three participating pharmacies with naloxone – a life-saving medication used to reverse the deadly effects of opioid overdose – in addition to education courses on how to diagnose, prevent and reverse an accidental opioid overdose. August 31 is International Overdose Awareness Day, and SpartanNash encourages store guests to prevent accidental opioid overdoses by avoiding alcohol, benzodiazepines such as Xanax, Ativan and Klonopin and other medicines while taking opioids; and being careful when missing or changing doses, starting to feel ill or beginning new medications. To participate in the Opioid Safety Project, SpartanNash – which owns the Family Fare Supermarkets andD&W Fresh Market piloting the program – has partnered with Dr. Sandra Dettmann, M.D. of the Dettmann Center, P.C. The Grand Rapids-based addiction medicine physician authorizes the three pharmacies to dispense the safety kit and naloxone medication to patients. Store guests with an opioid prescription from any physician are asked if they would like to participate in the program, and if so, they are then provided with additional information and education regarding how to safely take their opioid medications and how to properly use the naloxone should the need arise. They are also provided with an overdose reversal kit that includes naloxone, a face shield for rescue breathing and an information pamphlet on the symptoms of an opioid overdose and how to give naloxone. In the case of an opioid overdose, caregivers should call 9-1-1, administer the naloxone provided in the SpartanNash safety kit, perform rescue breathing and stay with the patient until help arrives. According to Michigan’s Prescription Drug and Opioid Abuse Task Force report, 44 people die in the United States every day from an overdose of prescription painkillers. The goal is to expand the pilot program to additional SpartanNash store locations in greater Grand Rapids.